As the year broke, Japanese POW were still being moved to Pulau Rempang as part of Operation 'Exodus', and Fort Siloso was still part of the HMS Sultan2. But things were to change. He also reported on the buildings, stores, equipment, searchlights and ammunition of the batteries. Colonel Rice’s recommendations about the restoration of the coast batteries came to nothing, but a decision to re-arm Fort Siloso was made. Fort Siloso would require much work to put it in order. Much new equipment would also be required to make the Fort operational one more. The war damage, left in the main untouched by the Japanese, would take a lot of repairing. Although both the 6 Inch BL Guns were beyond repair, it was thought that the pedestals, carriage, cradles and shields could be repaired using local resources. The magazine was described as being ‘serviceable’, but needed new equipment. The Engine Room had been stripped of its equipment, but was structurally sound. The searchlight emplacements were in good condition, but what was left of the searchlights themselves was considered to be not likely of value. The Battery Observation Post and the Searchlight Director Station had been stripped of equipment but were in good condition. In March 1946, under the command of Major L.W. Hall R.A., the 1st Singapore Coast Artillery Battery was Formed at Batu Berlayar. The men forming the unit were Malay soldiers, re-joining the British forces following the Japanese Surrender. In August 1946, 1st Malay Coast Battery Royal Artillery moved to Blakang Mati. This Battery was formed from the 1st Singapore Coast Artillery Battery and was commanded by Major L.W. Hall, R.A. Two usable Mk. 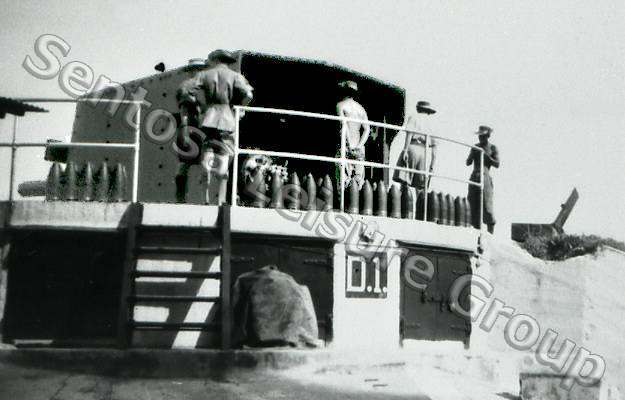 VII 6 Inch BL Guns were retrieved for use at Siloso. One from the Labrador Battery, and the other from the Beting Kusah Battery at Changi. The Japanese had repaired these guns and put them back into service. However, neither had fired a shot in anger whilst in Japanese use. It was probably around this time that the damaged overhead cover was removed from the emplacements. Despite the bringing of the guns to Siloso, there was no equipment available to make use of them. The buildings on the hill, where the Barrack Room displays are today, became Malay Other Ranks and NCOs accommodation. The old Officers Shelter became Senior NCOs accommodation. A general shortage of accommodation meant that tents had to be used as accommodation and for the cookhouse. It was to be several years before these would be removed. 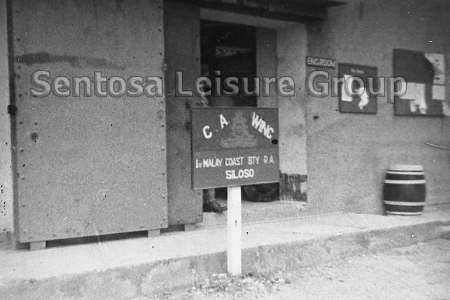 On 10th October 1947, The Coast Artillery Training Wing of 1st Malay Coast Battery, moved in to Fort Siloso. In December The Battery Commander was Major Brewster with Major Hall in charge of Training. A Fire Director Table arrived from Ceylon and was installed in an accommodation unit. Importantly, the training of the Malay Gunners began. In January 1948, a small group of REME (Royal Electrical and Mechanical Engineers) men arrived in Siloso. Their task would be to inspect and appraise equipment and the guns. Also they had to prepare for new equipment being brought in. One of these men was Craftsman Harold Dursley. One of the first task for REME was to establish a small workshop. Harold found that the Position Finder beside the Battery Command Post would be ideal, so set about creating his workshop. The Position Finder had been built prewar on the No.1 (right-hand) Emplacement of the 1900-1910 6-Inch Quick Firing Gun Battery Sadly, this historic little building was demolished when the fort was renovated in 1994. Harold recalled his time at Fort Siloso in 1948/49. He said the cooks at the Fort were local Chinese. What they provided for the men was, “Plentiful and very good”. “We had an enterprising young Chinese lady who came around the tents calling, “Sew-sew” - she did a great job keeping our socks darned and buttons sewn on. She sat in the entrance of our tent. She probably supplied the same service to the Japanese when they were in residence - who cares - she was a charming lady and we all have to live”. “It is only when I see the expanse of the harbour in my photo, I shudder to think of those Chinese Sampan owners who rowed us back in the pitch dark after a night in Singapore. Despite a vicious tide they always managed to get us back safely to Fort Siloso. Their rewards were not very good, I think we paid them a very small percentage of the Malayan Dollar which was 2/4d (Two Shillings & four pence) at that time” — Harold Dursley. In January 1948, a Twin 6 Pounder Gun arrived from Ceylon, and was mounted at Siloso Point where the wartime 12 Pounder QF Gun had been mounted. The mounting for each gun being different, the emplacement had to be modified for the new installation. The Twin 6Pounder was mounted and tested by the end of March. Power for the gun was provided by two Lister engines in an engine room close by, beside the magazine. The Director Tower was re-equipped with range finding equipment, tide levers and other equipment. The lower floor was used to direct the three AMTB searchlight posts. By May, the Malay gunners were being trained in the use of the 6 inch guns, the Depression Range Finder, Fire Director Table and the searchlights. In 1950, following a firing practice, the 6 inch guns guns were condemned due to the violence of recoil on each shot. These guns were replaced by two Mark 24 6 Inch BL Guns on Mark V Mountings which had been brought to Blakang Mati from Haifa, Israel. A third gun was mounted in the Barracks area for training purposes. The same type of gun had seen service at the Sphinx Battery on Pulau Tekong. 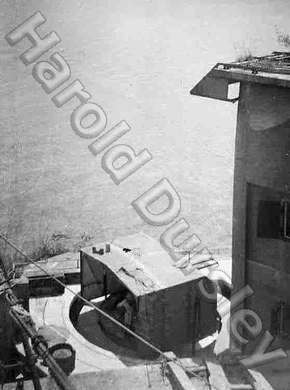 Also in 1950 a Mark 1 CA 2 Radar [CA=Coast Artillery] was installed at Fort Siloso. In 1951, a Seawards Defence Headquarters was established on Mount Serapong and this made use of the radar that had been established at Siloso. There was still a lack of equipment and some had to be manufactured locally in order to make the battery operational, albeit at a much reduced range. During the year, the battery carried out several practice shoots. From then until the disbanding of coast artillery abroad on 25th May 1956, the guns carried out several more practice shoots. In 1956, coast artillery regiments in the British Army were disbanded. The Army had finally realised that coast artillery had had its day. Fixed defences such as these had no further place in warfare. The armament at Fort Siloso was removed and scrapped. Fort Siloso was retained by the British Armed Forces. It became a religious Retreat Centre for Catholics serving in the forces. The 2nd Battalion, 7th Duke of Edinburgh’s Own Gurkha Rifles also made use of the Fort. Later the 2nd Battalion, 10th Queen Mary’s Own Gurkha Rifles replaced them, remaining until 1967. In 1967, the long British tenure of Blakang Mati came to an end. The island and its various establishments were handed over to the Government of Singapore. SAF Maritime Command and elements of SAF artillery, engineers and other staff, came to call Blakang Mati home, from 1967 until 1972. In 1969, a plan was developed to change Blakang Mati from a military area to something altogether more peaceful – tourism. The first step to the ‘State of Fun’ as it is called today. The Sentosa Development Corporation were formed in 1972, and carried the plan forward.. Also that year, the name Blakang Mati (Island behind death – one of several translations) passed into history. Such a name was unsuitable for its future use. The name Sentosa, or Peace and Tranquillity, was chosen from names put forward. Fort Siloso still had life left in it. In 1975, it was opened to the public as a tourist attraction. Historic guns from Singapore Island were moved there to form the Gun Museum. These were joined by other guns which were found during construction work at Woolwich Loop, between Fort Connaught and Mount Serapong. Another gun, found buried in the Fort also joined those on display. Parts of the fort were pretty overgrown and stayed that way until a period of time. Later, a considerable amount of renovation and restoration work was undertaken between 1994 and 1995, with further work carried out in the years that followed. Unfortunately some of these ‘restoration works’ caused damage to the fort, damage which gives a false impression to the visitor. The Position Finder on Mount Siloso was demolished. In the sub-surface complex leading to Siloso Point, the engine room was stripped of machinery and partitioned to make an audio-visual theatre, and a false wall was constructed which gives a totally inaccurate appearance to the passageway. Doorways were driven through the thick walls dividing the rooms in the Casemates, and a door destroyed an ammunition hatch in the 6-Inch BL Gun Emplacement Magazine. 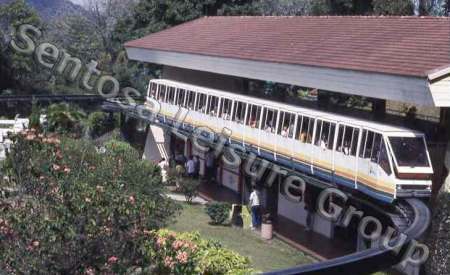 A 1·6 Km monorail service around part of Sentosa began in February 1982. 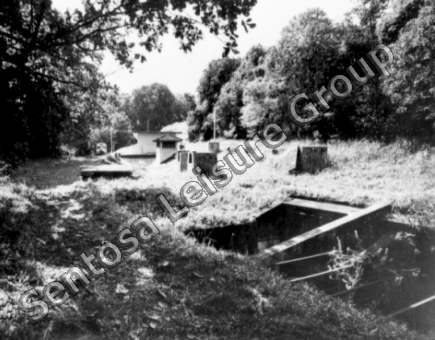 A monorail station with a gift shop below was built between the two original 7 Inch RML Gun Emplacements opposite the the Magazine near the Fort’s road entrance. The monorail ran until March 2005. The now redundant monorail station then was transformed into the Surrender Chamber. The Chamber houses displays showing both the British Surrender of February 1942, and the Japanese Surrender of September 1945. For the casual visitor, person with an interest in Singapore Military History, or for the avid historian, there is much to see at the Fort. A few hours of your time takes you through a significant period in the history of Blakang Mati.